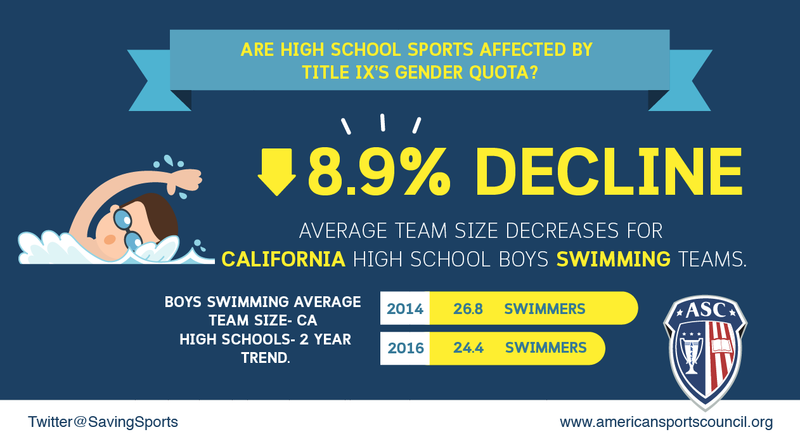 The average roster size for high school boys’ swim teams in California has declined by almost 9% in the last two years! On December 5, 2016, SavingSports posted stats showing an alarming statewide participation rate decline of 4.6%, since 2014, for California high schools boys swimming. We illustrated a two year downward trend of participation rates based on statistics from the National Federation of State High School Associations. Looking deeper into the problem, it appears that the reduction in participants was not driven by a loss of teams, but a reduction in average team size. The practice known as ‘roster management’ has been used by college athletic administrators for years to reduce male participation rates. When a school finds itself out of compliance with Title IX’s gender quota, administrators often ask coaches to limit male team roster sizes. This practice goes completely against the stated language of Title IX, because it in effect denies participation in sports on the basis of gender. Male athletes are cut from teams solely so that schools can comply with the proportionality prong of Title IX. Unfortunately, it looks like this unfair and unconstitutional practice has trickled down to high school sports in California, where the Title IX ruling, Ollier v. Sweetwater Union (See SavingSports- Appeals Court Paves Way for Gender Quotas in HS Sports) has jurisdiction. No Replies to "Diving Deeper into CA HS boys' swim decline"